Contrary to weather forecasts it pissed down last night. Seriously tropical rain that tested the tents mm rating with a few drops getting through. Consequentially it was a very late start rain stopped at 10. Tent dry and chicks away at 12. Curvy glorious wet roads and oncoming camper vans taking up 2/3 of the road made it a little uncomfortable, but an hour or so saw us in our first real coffee shop denoted by three motorcycles parked out side. The coffee was great so we stayed for two and recharged our devices un aware more rain was on approach. As we left it started bucketing down again. Visibility was bad and water on the road was deep enough in places for a bit of aquaplaning. Around 4 we checked into a budget guest house in Ryukan to dry out and soon after went out for a Norwegian attempt at Chinese, which turned out not too bad at all. 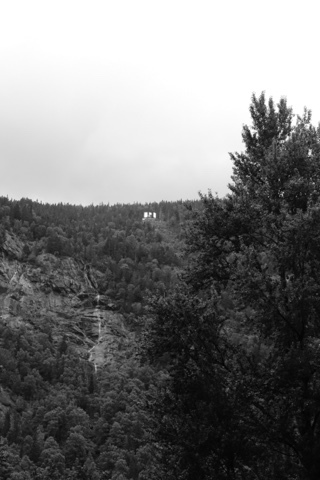 Rjukan is in a valley which in winter has no sun whatsoever. An enterprising resident has designed and built 3 sun tracking mirrors atop the mountain to reflect a patch of sun light at 80% original strength onto the town square. This provides a patch of 60 square meters of sun for the residents to catch some Vitamin D.